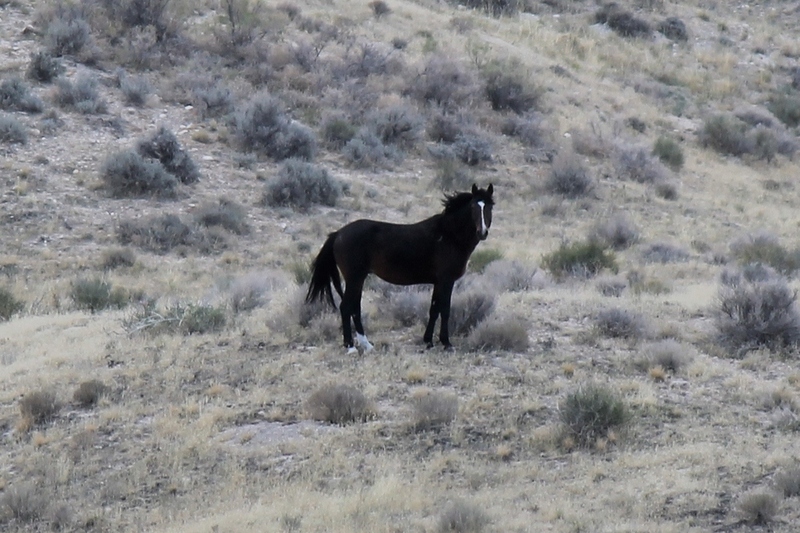 This area is home to one of Utah's largest herds, estimated to include around 700 horses. This is also the area I presently know best, having visited nine or ten times during the first year of this project. 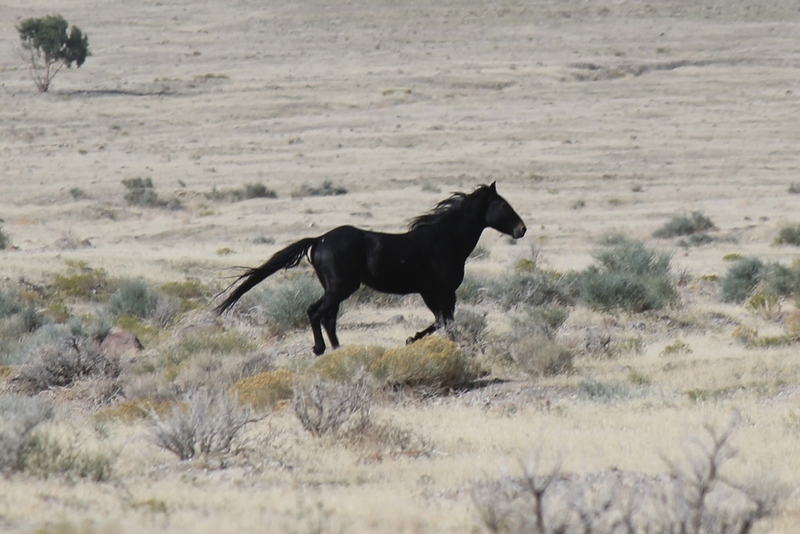 I have encountered lone bachelors wandering the southern foothills; bands of various sizes grazing throughout the area; and on one thrilling occasion, a small stampede of nearly forty horses blazing across the western flats. 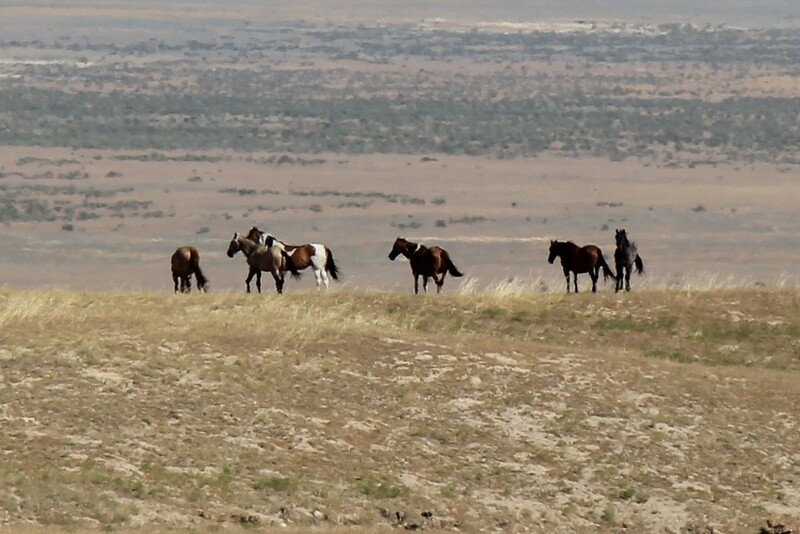 Want to learn more about the horses and history of this incredible mustang viewing location? My experience so far suggests members of this herd are less likely to be spotted from the roads during the spring and early summer, but you never know what you might see from one day to the next. A Pronghorn racing across the playa is a common sight through the warmer months. Ravens are everywhere, as are the horned larks that dart from the brush, like dolphins before a ship, as you rumble down these rustic roads. Lark sparrows, rock wrens, and other small birds sing sparse tunes from the junipers lining the springs and seasonal washes. My wife and I once spooked into flight a half-dozen turkey vultures lurking on the log fence posts as we rolled up on the South Valley Road turnoff. I have also watched a family of chukars scampering through the brush near Brown's Wash as a golden eagle circled above, and a relatively rare (in these parts) red-shouldered hawk surveying the territory around Cedar Spring. The Cedar Mountains are located approximately 50 miles west of Salt Lake City, separating Skull Valley (east) from the southern stretch of the Great Salt Lake Desert (west). The defined herd area includes sections along the eastern side, but I have had much better luck on the western slopes and playas. The main road running along most of the western front, Cedar Mountain Road, is wide, level, and well-maintained. This road runs between Hastings Cutoff Pass, a few miles south of I80, and Rydalch Pass, some 20 miles further in. Brown’s Spring, at the western mouth of Rydalch Pass, includes a watering trough and a small corral. The route turns eastward at this location, continuing through Rydalch Pass into Skull Valley. Although the primary roads through this area are generally well-maintained, they tend to be carved into the finely-grained surface. This renders them susceptible to localized pooling of rain and spring runoff, and the resulting puddles of thick, slippery mud can persist for many days after a storm. On the flip-side of this coin, prolonged periods of dry, windy conditions can lead to deep accumulations of silty sand through long stretches of these roads. This is particularly true when the roads have been graded but rain has not fallen for several weeks afterward (the resulting mud eventually dries to form a solidified surface). These sand-trap can be dangerously deep in spots where the silt has filled dips and depressions in the road. High clearance 4WD is highly recommended, and extreme, talc-like dust should be anticipated. There are two hazardous waste facilities within a couple of miles of the freeway -- Clean Harbors incineration plant near the eastern bench and the Energy Solutions "low level" nuclear waste storage facility several miles to the west. If you are concerned about exposure to emissions from these facilities, consider coming and going exclusively through Rydalch Pass, rather than looping through to I-80 on the western side of the mountains. Also, Senator Orrin Hatch has proposed designation of the area lying along the western front between Clean Harbors and the Dugway Proving Grounds as a buffer zone extension of the Air Force training range, which stretches north-south along the HMAs western border. Under this plan, public access would be prohibited while training missions are underway. If Senator Hatch's bill becomes law, I will do my best to keep this page current with scheduled closure dates. Much of the Cedar Mountains, including Rydalch Pass, is designated wilderness area. Motorized travel off established roads is prohibited. Also, rain can transform the surface of the roads in this area into a thick, slippery mud - "greazy," (sic) as one local described it - so be aware of recent or impending weather events. Access is relatively easy (4WD optional) during dry weather from either side of the range. To reach the western viewing areas from Skull Valley, take I-80 west from Salt Lake City approximately 43 miles to Exit 77 (U-196, Iosepa/Dugway). Upon exiting, turn left at the stop sign and continue along UT-196 for approximately 17 miles. Along the way, you will pass Lone Rock (3 miles) and Horseshoe Spring (9.5 miles). As you approach the 20 mile marker, watch for the BLM sign at the southern end of the large cattle yard, indicating the road to Rydalch Pass and 8 Mile Spring. Follow this dirt road for approximately 3/4 mile, until you cross the cattle guard. Immediately beyond the cattle guard, veer southwest (left) onto South Valley Road (unmarked), and continue for another 12 miles to Rydalch Pass. About 11 miles in, as you approach Rydalch Pass, Rydalch Road will join on the right. Another road branches left toward Cochran Spring about 3/4 mile further on, but stay the course and follow around to the right, onto Cedar Mountain Road. The pass itself is about 5 miles from entrance to exit. It is narrow in spots, with a couple of short, steep climbs along the way, but shouldn’t be a problem in dry conditions for most passenger vehicles. Coming out the other side, you will notice Brown’s Spring off to your right. Now you are in the heart of Cedar Mountains Herd territory. 2WD visitors stand a fair chance of spotting bands on either side of Cedar Mountain Road between Brown's Spring and Quiney Spring, about 7 miles north. To access I-80 from this side of the Cedars, reverse the directions provided below. To reach this area from the western side of the Cedars, continue along I-80 another 21 miles to Exit 56 (Aragonite). Follow the paved road south for about 2 miles, turning left at the intersection with the dirt road immediately before you reach the Clean Harbors hazardous waste incineration facility. Travel east about 1-1/4 mile and turn south on Cedar Mountain Road. You will travel at least 13 miles before sightings become likely (beyond Quiney Spring), and another 7 miles to Browns Spring/Rydalch Pass. Continuing on through Rydalch Pass (about 5 miles), be sure to keep left when you reach the fork as you exit into Skull Valley. From here, just reverse the directions for accessing the area from Skull Valley (above). The entire loop from Salt Lake City and back, with no side trips, will total nearly 170 miles, about 40 of which are on dirt roads. The nearest gas station is a truck stop in the tiny community of Delle, at I-80 Exit 70 (Skull Valley side, 7 miles west of the Iosepa/Dugway exit). From Northern Utah County take Pioneer Crossing west from American Fork (becomes UT-73) about 42 miles to UT-36. Turn left and continue 3-3/4 miles to UT-199, then head west another 22 miles toward Dugway. At the church just outside the Dugway military entrance, take a hard right onto UT-196. Continue north about 7-1/4 miles, and turn west (left) onto this dirt road. The road proceeds on a straight course for about 5-1/2 miles, then veers northward (keep right at the fork). Continue north then west along this road 8 miles to the crossroad, then north another 2 miles to the mouth of Rydalch Pass. From this point, refer to information provided above for accessing the area from Skull Valley. From Southern Utah County and points south, take US-6 west from Santaquin 23 miles to UT-36. Turn right and proceed north 38-1/2 miles to UT-199. From here, continue with directions provided in the paragraph above. About 1-1/2 mile north of Brown's Spring, take the road at Brown's Wash branching west from Cedar Mountain Road. This road can be deeply rutted from seasonal runoff, so take care negotiating the hills and turns. A little over a mile in, the road hairpins back toward the southeast for about 500 feet before turning westward. A few hundred feet further on, the road forks, with the main road arcing northward. At this point, maintain your southwesterly heading onto the rougher "upper trail" rather than veering right on the better-groomed road. Continue on this trail a little over 6 miles to Cedar Spring Road. Cedar Spring is about 1-1/4 mile east from this point, but your best odds for spotting herd members are along that rugged 6 mile stretch. I need to spend more time in the southeastern quadrant during the summer months, but a drive-through in January 2016 yielded two mustang bands, one coyote, and the location of a pump-driven watering hole (pictures below). Starting from the first fork in the road exiting eastward from Rydalch Canyon, turn south (right) along the road to Cochrann Spring. My first sighting appeared just short of a mile down this road, in the foothills directly west, just before the road jogs east for a few hundred feet before turning southward again. Continue along this road another mile to the crossroad (referenced above in directions from northern Utah County). Turn left, heading eastward into the small canyon. My second sighting occurred about 1.5 miles down this road, on a ridge rising about 1/4 mile south of the road. To visit the watering tank, continue another half mile until the road curves southward through a gated barbed wire fence. Rather than continuing through the gate, turn left onto the northbound jeep trail. Follow this trail for about 1.5 mile. This area is bordered south and west by Defense Department land (Army to the south and Air Force to the west), with commercially operated hazardous waste disposal facilities in the northern section near US 80. Obviously, you should not breach fences. Even in the public area, steer clear of anything that looks like unexploded ordinance (I have yet to see any such objects, but you never know). Hastings Pass cuts through the northern arm of the Cedars a few miles north of the defined herd area. The Donner-Reed party was among the first to try this ill-advised route to California, and the path of their wagon wheels can still be discerned in various locations. At the pass summit, take the two-track trail south along the ridge about 1/4 mile to view their tracks climbing from the east and descending into the ravine to the west. One interesting and little-known location in the northwestern section of this area appears to be a World War II era bombing practice target, likely used by units stationed at the old Wendover Air Base (where the Enola Gay trained). This location includes a circular target with a 100’ diameter bulls-eye and outer perimeter of 1,000’. The target is difficult to find on the ground, but easy to see in aerial photographs (if you know where to look). Some 2,500 feet from the bulls-eye are the remnants of two observation towers, one of which is still standing. Fragments of 100 pound practice bombs still litter the target and surrounding area. What do Kit Carson, the Donner Party, Mark Twain, Dwight Eisenhower and the founder of the Indianapolis 500 have in common? They all tie into the history of the roads and trails crossing Tooele County, Utah. Explore the fascinating history of the region these magnificent horses continue to call home. 80% of proceeds will be donated to the American Wild Horse Campaign. The remaining 20% will help keep this free web resource online.